Deze oplossing is schaalbaar, zo kunnen er eenvoudig appliances worden bijgeplaatst welke direct worden herkend en vervolgens worden meegenomen in het cluster. Software-Defined Data Center (SDDC) en Software-Defined Storage (SDS) heeft de toekomst, voor wie nu begint met het opzetten van een nieuwe omgeving of een relevante technologische stap wil maken is dit de optie. Op een Appliance kunnen tot 400 VM's of Virtuele desktops draaien, de nieuwe NVMe technologie geeft met > 400.000 IOPS een enorme boost aan de random Read/Write performance die nodig is om dit mogelijk te maken met de huidige gevirtualiseerde omgevingen. Voor meer informatie of een maatwerk offerte neem gerust contact met ons op! Supermicro's EVO:RAIL appliance is a complete Hyper-converged Infrastructure Appliance. It combines compute, networking and storage resources into a single 2U, 4-node form factor to create a simple, easy-to-deploy building block for the Software-Defined Data Center (SDDC). Supermicro's EVO:RAIL appliance starts with four independent hosts and a distributed datastore, implemented on the 2U TwinPro2 SuperServer. EVO:RAIL Deployment, Configuration, and Management enables power-on to VM creation in minutes, easy VM deployment and non-disruptive upgrade. Supermicro's EVO:RAIL appliance embraces latest compute, storage and networking technologies, with leading VMware certified components for peace-of-mind implementation. Supermicro's EVO:RAIL appliance is ordered via a single SKU and backed by Supermicro Global Service as a single point of contact for hardware and software support. 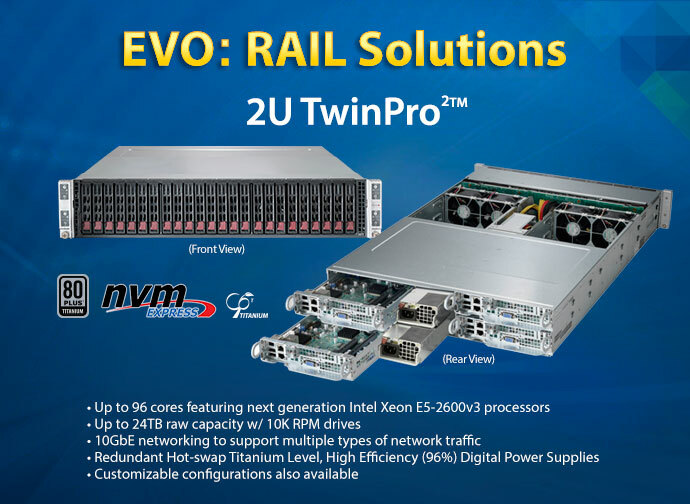 Supermicro's 2U TwinPro2™ SuperServer, is the foundation to implement for EVO:RAIL hyper-converged infrastructure. This scale-out solution features an optimal balance of compute, memory, storage and networking in a high-density 4-node, dual processor server appliance, simplifying virtualization across Enterprise, private/hybrid-Cloud, End-user computing and branch office environments.